I am so excited to be part of this year's boxed set. Today's post is all about all the amazing stories available to read. I read the previous two years boxed sets and all the stories involved. 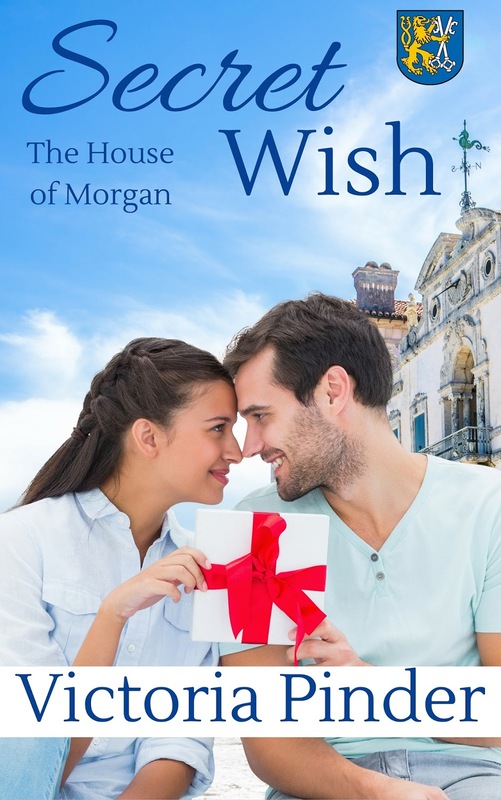 This year, my novella Secret Wish, is joining the set. I had so much fun remembering Christmas when I wrote this. This year with the birth of my first daughter, I'll get to experience the season as a mom. Writing this while pregnant really made me look forward to December. This was my first chapter. "Doctor Morgan, you're being paged." Luke Morgan turned to the nurse as his name echoed over the speaker that said he should report to the nurse's station. Strange no code was announced, so he had to assume someone new worked here. He passed the carolers who were visiting all the rooms to fill the place with holiday cheer. Luke walked briskly away from any sign of Christmas. One of his patients must be critical. He dropped his coffee cup into the basket, and the rubber of his sneakers squeaked against the linoleum floor. "Thanks," he said as he ran past the nurse that stood at the door. His mind shuffled through which of his patients might be in trouble, but today he hadn't seen anyone close to critical in the ER. Someone must have been wheeled in from an ambulance. He fixed his stethoscope around his neck and turned the corner. His sister, Elizabeth, stood there, with her shoulders straight, in her new House of Morgan ensemble that currently rivaled Prada, and acting like she was now an heiress. The pretense didn't help them. Their billionaire father had ruined their family, and it was better to not acknowledge their inheritance. He slumped his shoulders. "Liz, I don't want to talk about accepting the trust fund in my name at the bank. Mitch Morgan ruined our mother and is probably to blame for your son’s disappearance." "He was still our father." Her hands went to her hips. "You know I need the money. I need the best private investigator money can buy to find my baby." "Come with me to my office." She dropped her hands to her sides and followed him. Every fiber in his being told him that Mitch Morgan orchestrated his sister's loss, and his money would not bring her son home. He opened the door and then closed it behind him once she came inside. He stared into her brown eyes and said, "Sis, we've been through this." "It's Christmas, Luke." Her head shot up. "I can't give up on my son. I need a miracle." Miracles were for fairy tales. Christmas wasn't about hope. It was his job to protect Liz and Mom from more of the heartbreak that the Morgan name brought them. If he had a way to help her, he'd have given anything, but he didn't believe her plan had merits now. "I'm not saying that. We've bankrolled the best detectives money can buy, Liz, and no one has found any clue in months. There is nothing we can do except find more people to recruit and help us." "I can't." She choked on tears. "He's my son, my baby, and I lost him." "He was kidnapped. The more I hear about Mitch Morgan, the more convinced I am he did this to you. We should stay away from his name, but otherwise, I wish I knew how to help." Their father hadn't approved of their sister Victoria's child. Their father had told her that her baby girl died at birth and let her live her life without her daughter until Vicki realized the truth. Mitch probably had the same thoughts about Elizabeth's. The difference with Elizabeth was the father of the child wasn't a good guy, and in no way would he raise a son on his own. He took her hand in his. "I will continue to pay for everything. The trust fund money so far has all gone toward the search and that's fine. Take every dime I have. You know that, but you have to take care of yourself too." "I need you to go with me to this wedding." She shook her head and dropped her hands to her sides. "You don't have the resources that Peter and John do. Money isn't enough. We need their connections, and I want your support. We are all family. They are our brothers." "There is no resource that money cannot find and they were raised by him." The wedding was a joke. He had no answer for how to help Liz find her kidnapped child. It had been three months already, and the trail was cold. The detectives told them to begin to grieve, but she saw Christmas as a reason to hope. Right now there was nothing. “I don’t see how you trust them.” He turned to his sister. “They might be our siblings but we didn’t grow up with them. Besides, they were raised by the same monster who probably set you up and took your son.” He coughed and shook his head. “Look, I don't want to talk about this at work, but you never had time to build trust with any of them." "He was our father too and my instincts say I trust them." She crossed her arms, looking and acting exactly like their mother. Her glassy eyes now mirrored the pain Mom always embodied. Every cell in his body wished he knew what to do to help as she said, "They are our brothers. Peter's getting married. Let's go and play nice, so I might find the people who stole my son." Liz was on her personal mission. His body was chilled by the reality that he hadn't been able to help her so far. He stilled. "What does his nuptials have to do with taking that money? I'm afraid you're putting too much stock into Christmas." "Luke, you're not listening. We have to be a family. So get over yourself." Elizabeth wasn't wrong. He glanced at his door and longed to deal with his patients, who he could help unlike his sister and her crisis. She made him feel helpless. If everything worked out, today's shift would be a rare one with simple, easy-to-fix patients. Right now he had patients. He couldn’t help his sister or locate their brother for his help either. He was older than Elizabeth by seven minutes. Last he heard, their other brother, Matthew, had been at some conference in Brussels for a few weeks now. He took a deep breath and told Liz, "Sis, please think about what I said. I have to go now." She met his gaze, and he saw her lower lip push out in a pout that always got to him. "I need you to come with me to Peter and Belle's wedding. He's our brother." No. Mitch Morgan, their father, had forced their mother into seclusion and sent the three of them to boarding school as soon as they were six. Now he understood Mitch had kept Peter, Victoria and John from their mom and then taken the three of them from her too. He hadn't known till well after college, and then Liz's son was kidnapped a week after they reconnected with their own mother. Liz had to see that the three other siblings meant more bad news for the rest of them. Their father had to have a hand in this. "You should have come to the party with Mom." "I don't want to meet them." "Are you going to tell Mom that?" Their mom saw the appearance of John, Peter and Victoria as a blessed miracle. He'd have better luck with negotiating peace in the Middle East. His stance widened as he slipped a printout that was automatically forwarded from a nurse into his white doctor's coat. Liz didn't mention the interruption and continued with her argument. "From what I read, our sister, Victoria, thought her own daughter was dead. For all we know our father could have done the same to me." At least she had the same suspicions he had. "He died the same time as the kidnapping. I have no way of retracing that man's steps and that’s exactly why I don’t want us to bother with them. Mitch Morgan kept Peter at his side at all times." An email came through about a new patient that might be dehydrated. He sucked in his breath and stood. "Liz, our world is fine without the rest of them." An alarm went off that indicated there was an emergency. "I have to go for now. I have patients." She stepped in his way and blocked the door. "You don't have a life either. All you do is work. Come to the wedding and all the festivities that begin tomorrow." The alarm ended, which meant another doctor was already there. An argument here would be heard, and he had a reputation. He couldn't call Peter and John his brothers, not if they were anything like their father. He couldn't take a chance. So he deflected what he wanted to say. "I don't have a tux." She shrugged. "I'll send it over to your condo on Collins Ave."
His forehead was hot, but he still kept what he wanted to say to himself. He glanced around her to the door. "I don't have a date, and you and Mom have wedding duties." She smiled and again stepped in his way, so he couldn't clear a path. "I'll set you up with a hot woman to have on your arms for the night." The last time he’d kissed a woman in Miami, it had scorched his soul. Caro Soliz was a college dream, who probably was married with three children now. He lowered his voice and narrowed his gaze. "You're finding me a date now?" She dropped her hands to her sides. At least now she seemed more like the girl he grew up with. He squared his shoulders. "We don't know anyone in Miami. We’ve been here less than a month." "You moved because you’re a good son. I moved here as the investigators tracked Brandon to Miami." She smiled like she would for some child. He shook his head as she said, "You have this nice job already. Matthew will be transferred to a Miami branch soon. We're all going, and it would be wrong for you to miss it. It's Christmas, Luke. I need that miracle." Miracles weren't just offered. A brief vision of Caro Soliz flashed in his mind. He blinked and the thought left him. "Where are you finding this woman for me?" She shuffled on her feet. "I have my ways." She had no clue. He should let her and then whatever disaster she found, he could tease her about for the next decade. At least she wasn't crying again. He smiled. "Fine. It seems you are determined." The teasing needed a set up. "You owe me." Anything that helped keep her smiling would be good, though he already imagined what a horrible date she'd find at the last minute. "I'm letting you find me a date for a wedding. I'm sure I'll have something to say once I meet this woman." If she needed him at this wedding for the show, then fine, he'd go. He tapped his fingers on her arm to ensure she was listening. "In most things, no problem, but I've met the line of losers that you called your boyfriends." She shook her head. "And the quiet mice that you brought home to dinner were what? Stellar examples of your taste?" One of the losers she had dated might have been the one who kidnapped Liz's child. What happened that day sounded too planned out. He'd spent money finding every possible ex of hers, but he never found Brandon. If the kidnapping was related to their dead father, their new last name should be kept a secret, not advertised. He kept these thoughts to himself and focused on what she said. "I like quiet women. You and Mom are the opposite and can give me a headache." Her lips curled into a smile. "Stop it. Now go to your patients. I have work to do." At least she seemed stable at the moment. He reached out and hugged Liz as he said, "I love ya, sis." She turned to leave, but glanced over her shoulder. "Don't try to butter me up, and thank you for this weekend." He waited for her to leave, and then checked his paper printout on his next patient. He read numbers and realized this wasn't life threatening, but the patient might be distraught. As he walked down the hall, decorated with Christmas cheer, he picked up the patient chart outside the first door on his rounds. Now if he could wave his magic wand, he'd somehow help his sister find her missing son and help his own mother stay calm. As he slipped into the patient's room, he let his own thoughts go and put his effort into diagnosing what was next. Here, he knew what to do. Here he didn’t wonder if Brandon was dead and he hadn’t been able to find him. The ache in his heart grew stronger every day. Ring in the holiday season with 17 all-new, stand-alone stories from New York Times, USA Today, national bestselling, and award-winning authors. Sweet Christmas Kisses 3 takes you around the globe from small-town USA, to London, England, and even to Africa with a foreword written by USA Today Bestselling Author Donna Fasano. Don’t miss out on this sweet romance boxed set that’s sure to touch your heart, make you smile, and put you in the mood for Christmas. Snuggle into a chair by a cozy fire with a cup of hot chocolate and allow these bestselling and award-winning authors to bring the holiday season alive as they warm your heart. Thanks so much for your excerpt, Victoria. 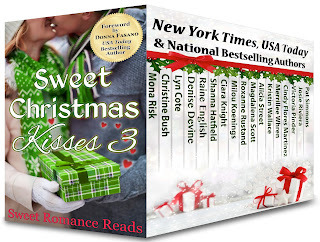 Great read and such an exciting day--Sweet Christmas Kisses 3 release day!